As illustrated in last week’s post, being data focused can help support your intuition as a marketer and ensure your efforts are reaping results for your business. The same logic applies to your social media presence as data can highlight what’s working and what isn’t on each channel you’re active on. These tips will by no means be an exhaustive list; rather, they will point you towards a host of free tools and techniques that will allow you to begin experimenting with data in your social media marketing efforts. Anyone who has experience with social media marketing understands that the idea of “social media” as an inclusive whole doesn’t really exist. The sheer amount and differences between various social networks make it nearly impossible to treat social media as one distinct entity. After all, you might be looking at the same person’s accounts across “social media,” but the behavior associated with their Facebook will vary wildly from their behavior on LinkedIn. This is why choosing the right social network is so crucial. As if social media wasn’t complicated enough on its own, once marketing enters the equation it forces you to analyze and predict how a user of a certain social platform will behave once they make it on to your site or interact with your product. Truthfully, predicting how a user from any given platform will interact with your content is almost impossible until you have lots of data to work with. Luckily, there is a relatively simple and free technique that will allow you to pinpoint which network your traffic is coming from and begin to measure and analyze how that unique traffic behaves. This tactic actually utilizes two separate tools, the first of which is Google URL Builder. As outlined in this fantastic video by KISSmetrics, Google URL Builder is a great free tool that allows you to assign various identifying information to any link to your website for viewing in Google Analytics. What link-tagging will allow you to do is to append different identifying information to the same link depending on where it’s place (to clarify, this is done manually). You can see how this begins to solve the problem of getting a sense of how different users on different platforms behave. You can take the same exact link, add unique UTM parameters to it and see how different people react based on whether they came from Facebook, Twitter, AdWords, etc. Even better is that Google Analytics will automatically add this data to your reporting to see which source converts the most, which provides the most engaged visitors and more. To take this even one step further you can utilize Google Analytic’s Advanced Segments tool to cross-reference and analyze these tagged links even further. Google’s segmenting options are truly staggering, but just some of the things they can allow you to do is to funnel all the UTM’d links from one campaign into a single segment and then allow you to determine the behavior based on such categories as first-time vs. returning users, age-range and demographic make-up, what types of technology they were using and a lot more based on the sharing of links around a single or multiple campaigns. Suddenly, just using two free tools, the very complicated mess of data coming from your social networks can start to come into focus and you can begin to tease out actionable insights from this information as long as you’ve got a few specific goals in mind that you’re trying to analyze against. One of the most valuable tools in a social media marketer’s arsenal are A/B tests. These kinds of tests allow you to isolate specific variables and to quickly and reliably pinpoint what works. In my previous post I gave multiple examples of large companies that utilize split-testing to great effect. However, in all likelihood, major brands like BuzzFeed and Refinery29 are running fairly sophisticated and frequent tests on their properties, which isn’t the approach every business needs to take on their own website. Worry not though, Google Analytics comes to the rescue yet again and provides all users of their free tool the ability to quickly and (relatively) easily set up A/B tests of their own. 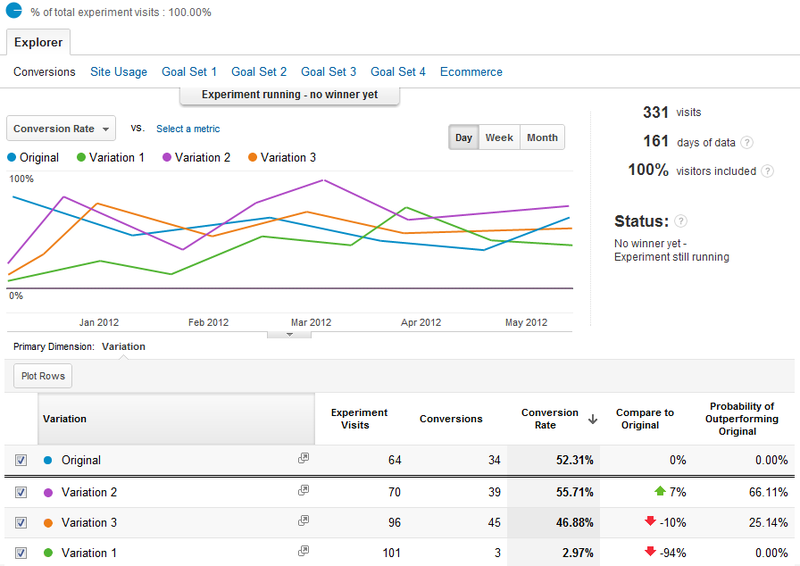 All you need to do to carry out your own A/B tests is to set up one or two variations of your page (for the sake of controlled experiments, keep these changes minimal) and to set up a goal for these pages (say a click on a sign-up button, the download of a resource or a conversion) and Google Analytics will take care of the rest. They will automatically redirect a predetermined percentage of your audience to all the variations you set up and will gather and analyze the results. This feature can greatly impact your social media marketing because it allows you a quick, versatile and easily repeatable way of testing landing-pages and other additional touch-points impact on the experience visitors from social media are having on your website. Perhaps the biggest hurdle that social marketers face is how to seamlessly direct users off of social platforms and on to their site with as little friction as possible. The ability to test and optimize these touch-points to minimize friction can be a major boon for maximizing your social strategy’s effectiveness. One of the most robust analytics tools available to marketers besides Google Analytics is Facebook’s Insights tool. Although it is relatively new compared to Google Analytics, Facebook’s developers have been expanding functionality like crazy and in the process have been giving its savvier users access to reams of valuable data. Not only does Facebook’s ad product allow for a great degree of information about your promoted posts, it can actually tell you a lot about every single piece of content you share. Even more useful is the in-built ability to take this accumulated data and export it to a spreadsheet that can be analyzed in Excel. This topic has been written, and analyzed to death. However, all of these figures can only be averages at best, and social media best practices will likely vary for your business based off your audience and industry. Facebook’s Insights tool can give you a much more precise picture of your ideal posting volume using a few easy steps. 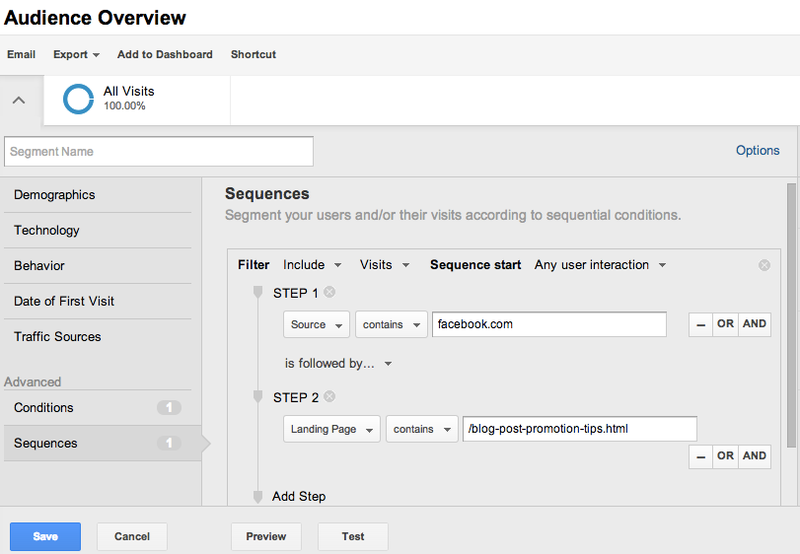 The first of these steps is to go to your “Overview” tab within Facebook insights and you should see an “export” option. Choose post data as your data type and decide upon a date range of your choosing. From here, you can download your data in a spreadsheet-ready format and then open it in a program like Excel to analyze your data. To determine your ideal posting volume group the posts by day and compare the data averages in the “Lifetime Post Impressions” and the “Lifetime Engaged Users” columns. When you are looking at this daily information you will notice that your user engagement will increase on days you posted more, but will do so only up until a certain point. The days that you posted more than your audience was willing to interact with will actually show a downswing in engagement. The ideal posting volume for your page will be the number of posts at which user engagement just began to dip. No picture of social media marketing is complete without taking mobile into account.Over 60% of all social media activity occurs on a mobile device. The problem is that casual mobile use is much less likely to directly lead to the conversions that are at the center of marketer’s focus. However, even though mobile social ads drive different results from users than desktop Facebook ads, they may nudge the user to buy in the long-run. Such multi-click attribution modeling has been a thorn in social media marketer’s sides for quite a while, and has made the task of monetizing mobile very tricky. With that being said (and with millions of potential ad dollars at stake), Facebook has recently devised a way to track purchases across devices. In order for Facebook’s cross-device tracking to work you must install a Facebookconversion pixel on to any pages whose conversions you are aiming to track. Once you have installed the pixel, then any ad that you run that points to a tagged page will have report generated that not only tracks the regular likes, reach and engagement; the report will also generate in-depth information about the journey a converted customer took from the time they clicked your ad all the way up until they made a purchase. Facebook’s statistics already show that nearly one third of users who show interest in a mobile ad will later convert on desktop. Figures like this can help give you a much more accurate picture of how successful your social advertising actually is at driving results. Without this kind of attribution, all of these assisted conversions might have been getting credited to another channel a user last clicked on before taking an action, and you would be getting a flawed impression that your social media marketing wasn’t working or was having a different level of impact. Such an error can rob you of just as much revenue as spending money on ads that aren’t working, so I cannot stress the importance of taking the time to do this. One common critique of social media marketing is that it is far-removed from the bottom line, but in reality it is just hard to measure. However, just because social ROI is difficult to quantify doesn’t mean there is no value to social media marketing (in fact the opposite is often the case) but what it does mean is that you have to get inventive with how you weigh this important metric. While there are a few paid tools that can help you measure your social ROI, combining a few of the free tactics we have outlined above can help you arrive at a rough idea (by no means exact) of your social ROI without investing in any costly tool. The first necessary step in this process is to find out the approximate value of a visit from social, which you can do using link-tagging and segments. For example if 1% of all FB visitors converts on a set goal of a campaign, and the average revenue of that goal is $50.00 then the average FB visitor value is $0.50. Once you have that number you can look at your FB ad insights and see how much it cost to get a single click and determine if that click cost more or less than $0.50. If it cost less, keep on spending until either the average value of the visitor goes down or the average acquisition cost goes up. There are certainly ways to get more granular with this number (for example, working cross-device tracking into your measurements), but just having a rough idea will put you leaps and bounds ahead of the competition and will also help steer you clear of any significant wastes of time, money and energy. The techniques listed here are by no means an exhaustive list, but they should help demonstrate the types of tools at your disposal and the various capabilities they give for data-driven social media marketers who are willing to leverage them. As you continue your path towards becoming a data-driven marketer, stay focused on constantly working with tools like these to develop new insights and to test your assumptions. If you are diligent with your implementation, you will quickly realize the benefits of incorporating data into your social media marketing.